Muscle Physiology Lab - Bruce Gladden, Ph.D. Muscle Biochemistry Lab - Andreas Kavazis, Ph.D. Hypertension and Vascular Health Lab - Michael Brown, Ph.D.
President Steven Leath created the Presidential Awards for Interdisciplinary Research, or “PAIR,” in 2017 that awards funding for up to three years for innovative, interdisciplinary research collaborations at Auburn University. The program funds ideas that foster creativity among different departments and will assist Auburn University in reaching the next level of research and development distinction. School of Kinesiology faculty are key researchers in two projects among the total of 11 that were selected. Andreas Kavazis, Ph.D. and Bruce Gladden, Ph.D. are working on A Mobile Mitochondria Laboratory (AU MitoMobile) to Lead the World in Measuring Bioenergeitcs in Natural Settings. It received Tier 2 funding, which provides up to $250,000 per year for established teams. Michael Brown, Ph.D. received Tier 1 funding to conduct Interdisciplinary Rural African American Aging Research. It provides new teams up to $100,000 per year for three years. Tier 3 funding was also available for high-impact teams, providing up to $500,000 per year. Over 100 proposals were submitted. Recognizing the limitations of studying mitochondria, the energy “power-house” of the cell, in a laboratory setting, Andreas Kavazis, Ph.D. and Bruce Gladden, Ph.D., will be part of a team to build a transportable lab to conduct research at field sites to capture animals in natural settings. The research team aims to lead the world in measuring bioenergetics in natural settings with the $636,941 in total funding provided over three years. Exercise physiologists Kavazis and Gladden are working with evolutionary biologists, environmental biologists, and engineers to develop the AU MitoMobile to measure mitochondrial energy production of vertebrates at remote locations, such as oil spill sites and other places where environmental disturbances have damaged the health of local wildlife. The Co-PIs on the grant are Dr. Andreas Kavazis from Kinesiology, Dr. Wendy Hood from Biological Sciences, and Dr. Geoff Hill also from Biological Sciences. Dr. Hill is one of the leading researchers on the AU campus. 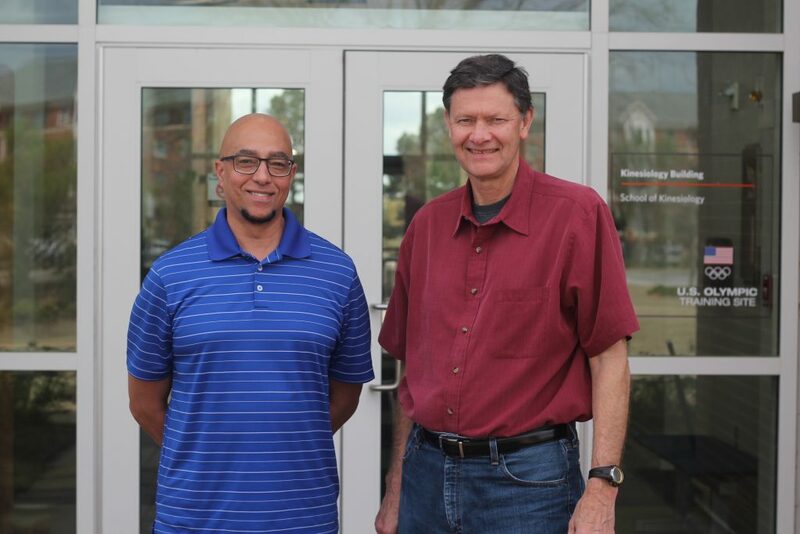 Dr. Bruce Gladden from Kinesiology is a Co-Investigator while Dr. Kristjan Niitepold of Biological Sciences and Dr. Mark Nelms, Mr. Mike Eddy, and Mr. John Tennant of Electrical and Chemical Engineering are collaborators. Dr. Kavazis and the Biological Sciences researchers have previously had ongoing collaborations, while Dr. Gladden has recently become involved with the group. The impetus for the project arose out of the realization that many studies of bioenergetics (the chemical pathways of energy in living things) are best done at remote field sites where animals with unique bioenergetics capabilities are most likely to be found and can be sampled onsite. A specific interest in these studies is mitochondrial function. Mitochondria provide the energy that powers complex life including fungi, plants, and animals, including humans. A specific study of interest will be an investigation of bioenergetics differences between migrant and non-migrant birds. Migrant birds fly long distances while expending energy at incredibly high rates. Why are kinesiologists like Kavazis and Gladden interested in birds? The answer is that some species of birds, fish, and other animals offer unique insights into extreme bioenergetics, and bioenergetics lies at the heart of exercise physiology. “These unique ‘animal athletes’ might also provide insights into not only human athletic performance, but disease as well,” Gladden added. In the first year of the grant, the goal is to purchase and modify the AU MitoMobile, a mobile laboratory for the study of mitochondrial metabolism in the field. This phase will rely heavily on the engineers on the research team. In Year 2, the AU MitoMobile will be outfitted with scientific equipment and validated, and in Year 3, field testing will be performed to provide proof of concept for granting agencies. Did you know that African Americans have a lower life expectancy and a faster progression of age-related diseases? To combat this issue, Michael Brown, Ph.D. and his team of Auburn researchers will assess the psychosocial stressors that can contribute to the problem of rural African American aging. Then, they will develop health-promoting interventions and positively influence polices that will improve health and social equity. With a $255,000 award over three years, the team will establish a sustainable research structure in east-central Alabama, partnering with surrounding communities to improve health in that community and beyond. The ultimate goal is to grow the scientific knowledge of how psychosocial risk factors can accelerate aging among African Americans. Brown explained that the unique collection of stressors that accumulate across the lifespan in rural African Americans leads to accelerated declines in physiologic function and accelerated clinical aging. Some of the most important physiologic aging occurs in the vasculature, both in the brain and periphery. “We are excited to be able to develop a novel research infrastructure to support interdisciplinary aging studies that integrate psychobiological and physiological mechanisms into research on racial disparities in health,” said Brown. The team consists of David Chae, Sc.D. (Human Development & Family Studies), Gopikrishna Deshpande, Ph.D. (Electrical and Computer Engineering), Loka Ashwood, Ph.D. (Agricultural Economics and Rural Sociology), and Dominic Cheng, Ph.D. (Department of Psychology). Two additional projects include supporting researchers from the School of Kinesiology. Michael Roberts, Ph.D. will help with the Development of the AU-NASH Research Program, a Tier I award receiving $150,000 over two years. NASH is nonalcoholic steatotic hepatitis, the most severe form of non-alcoholic fatty liver disease. The research team is developing a therapy program to help those that suffer from the disease. Matthew Miller, Ph.D. and JoEllen Sefton, Ph.D., LAT, ATC will aid in a Tier II project to Establish a Center for Neuroscience (CNS). The team will receive $637,500 over three years to use fundamental knowledge about the brain and nervous system to combat pervasive mental, neurological, and substance use disorders in our society. “I am very excited about the neuroscience center, as I believe we have developed a critical mass of neuroscientific researchers across campus, including the ones in the School of Kinesiology (Drs. Sefton, Pangelinan, Roper, Neely, and me),” said Matthew Miller, Ph.D. The PAIR program required teams to define an integrated interdisciplinary research effort distinguished by intellectual excellence and driven by a clear vision of fundamental scholarly advances, innovative discoveries, or technological developments having broad economic and societal impact. To read about all the selected PAIR grant research projects addressing critical areas of human and environmental health, visit the Auburn University Newsroom website.